Useful for in situ or field electrochemical analysis, they can be used with our screen-printed electrodes or with any other conventional electrode. Controlled by DropView Software, which provides powerful functions such as experimental control, graphs or file handling, among others. The new Multi Potentiostat/Galvanostat µStat 8000 allows simultaneous electrochemical measurements (with the same or different techniques) in up to 8 channels that act independently; it also includes a Multichannel mode, that acts as a potentiostat with up to 8 working electrodes sharing an auxiliary and a reference electrode. Powered by Li-ion battery (DC charger adaptor also compatible) and including Bluetooth as wireless connection to a PC (USB connection also available), the potentiostat features the main Voltammetric and Potentiometric techniques. The new Multi Potentiostat µStat 8000P instrument has the same format and technical specifications as the existing Multi Potentiostat/Galvanostat µStat 8000, but works only on the potentiostat techniques, thus allowing simultaneous voltammetries and amperometries (with the same or different technique) in up to 8 channels that act independently and having also a multichannel mode that allows you to work with up to 8 working electrodes sharing auxiliary and reference electrode. For those researchers that in the future may need to use galvanostat techniques, they will be able to self-upgrade the instrument with a "Galvanostat software update kit". The new Multi Potentiostat/Galvanostat µStat 4000 allows simultaneous electrochemical measurements (with the same or different techniques) in up to 4 channels that act independently; it also includes a Multichannel mode, that acts as a potentiostat with up to 4 working electrodes sharing an auxiliary and a reference electrode. Powered by Li-ion battery (DC charger adaptor also compatible) and including Bluetooth as wireless connection to a PC (USB connection also available), the potentiostat features the main Voltammetric and Potentiometric techniques. The new Multi Potentiostat µStat 4000P instrument has the same format and technical specifications as the existing Multi Potentiostat/Galvanostat µStat 4000, but works only on the potentiostat techniques, thus allowing simultaneous voltammetries and amperometries (with the same or different technique) in up to 4 channels that act independently and having also a multichannel mode that allows you to work with up to 4 working electrodes sharing auxiliary and reference electrode. µStat400 can be used with one- or two-working electrodes configuration and can be applied for Voltammetric, Amperometric or Potentiometric measurements, including 24 electroanalytical methods. µStat400 bipotentiostat/galvanostat is Li-ion Battery powered (USB charger adapter compatible) and it can be easily connected to a PC via USB, RS232 and Bluetooth ® . DropView software provides powerful functions such as experimental control, graphs or file handling, among others. Electrochemical techniques can be easily applied in many organic and inorganic reactions besides the possibility of characterize your synthesized compounds. µSTAT400 can be applied for Voltammetric, Amperometric or Potentiometric measurements, including 24 electrochemical methods. µStat400 bipotentiostat/galvanostat is Li-ion Battery powered (USB charger adapter compatible) and it can be easily connected to a PC via USB, RS232 and Bluetooth ®. DropView software, an easy-to-use interface, provides powerful functions such as experimental control, graphs or file handling, among others. µStat300 can be used with one- or two-working electrodes configuration and can be applied for Voltammetric, and Amperometric measurements, including 8 electroanalytical methods. µStat300 bipotentiostat is Li-ion Battery powered (USB charger adapter compatible) and it can be easily connected to a PC via USB, RS232 and Bluetooth®. DropView software provides powerful functions such as experimental control, graphs or file handling, among others. Small and portable bipotentiostat, that can be used with one- or two-working electrodes configuration, and that offers the most usual electrochemical techniques: Amperometry and Pulsed Amperometry, Linear and Cyclic Voltammetry, Differential Pulse Voltammetry and Square Wave Voltammetry. The instrument is controlled and powered by means of a USB connection. DropStat is a new concept in potentiostat instruments. For those researchers who have successfully developed an electrochemical sensor, DropStat is the perfect tool to demonstrate the real applicability of their own developed sensor. DropStat is a low-cost, small, portable, stand-alone, hand-held, single-technique, potentiostat-based custom Electrochemical Reader that is configured attending to customer's needs, thus allowing the researcher to have a unique instrument able to show in a LCD screen the concentration of the analyte for which the electrochemical sensor has been developed. FIAEC is a pack including all the necessary components to set up a continuous electrochemical analysis system. Flow-Injection Analysis (FIA) system with Electrochemical Detection (FIA-ED) has many applications in the laboratory and in process control as it is a powerful tool for analysis. 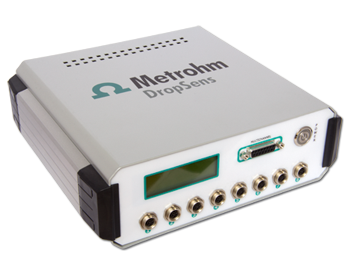 Metrohm DropSens SDK for LabView provides full control over Metrohm DropSens' portable potentiostats into LabVIew platform. This option is very useful in environments where java is not available and therefore the use of DropView 8400 software is not possible.